A late September afternoon on Old Orchard Beach, Southern Maine. 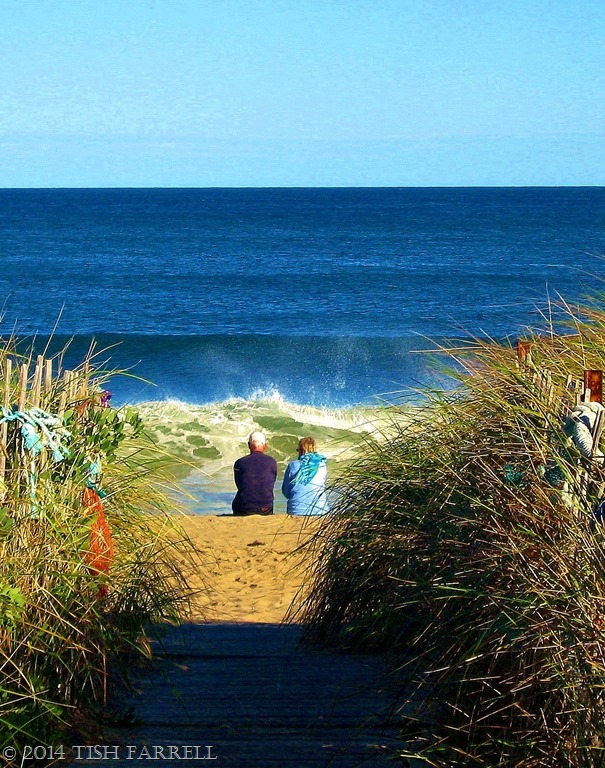 Posted on August 18, 2014 August 18, 2014 by Tish Farrell	This entry was posted in photography, Travel and tagged horizon, Maine, Old Orchard Beach, Tish Farrell Writer, Where's My Backpack Travel Theme. Bookmark the permalink. Very nicely composed, Tish, but many of your photos look oversaturated to me. Lions especially. Maybe my photos look dreary and washed out to your eye. Or perhaps my monitor isn’t showing me the true colours. You are right of course, Ian. I have a writer’s view of photos which is a rather different view from photographers’ perspectives. In fact I was just discussing this with OH. Also some of my older photos scan a little oddly, and that would include the lions. But then others still were taken in extraordinary light, which also includes lions. This I realise is not good ‘photography’ but then I just like making pictures. Mm. It’s how I remember it! Lovely Maine. You’ve captured a peaceful setting in this photo. The couple look like they’re sharing a special moment. Thank you, Celestine. I appreciate your coming here when things seem a bit stressed in your domain. Time to chill out maybe? Yes, I did read your post. I do sympathise, Celestine. Think I might need a break too. You’ve still got my email and/ or facebook link. We can always ‘talk’ that way if you want a chat. Good luck with the WIP.